← ‘Til the Break of Dawn: Daybreakers‘s Vampires Bring the Ruckus. Like a lot of legendary photographs, Albert Watson’s portrait of the Rolling Stones’s Mick Jagger, above, begins with another concept that isn’t working out. The original idea for the shooting was to have Mick Jagger driving a Corvette, with the leopard in the passenger seat. The big cat, a wild animal, seemed to suit Jagger, who likes to jump around a lot onstage, of course. However, putting the leopard in the car with him ended up being so dangerous that we had to build a partition. So, while we were waiting, I thought, “Let me try a quick double exposure with the leopard.” I shot the leopard first and drew its eyes and nose on the viewfinder of the camera. Then I rewound the film and photographed Jagger, fitting his eyes and nose over the eyes and nose of the leopard on the viewfinder so they matched. I didn’t think it would work, and I almost threw out the film. But of the twelve shots, four of them matched, and this was the best of the four that worked. 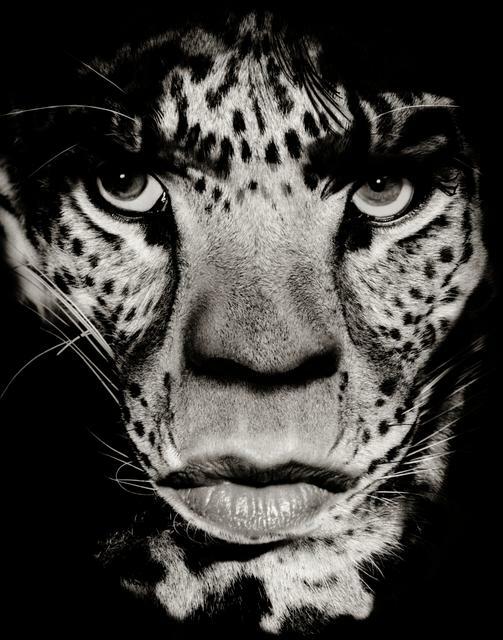 What’s amazing about the image is how, by combining the two subjects, Watson suggests a deeper truth about Jagger, inflecting his almost feline, preening aura; his famed, virtually predatory libido. I happen to think Watson’s creation story is nonsense, or, at best, incomplete. For example, did the leopard’s pupils and Jagger’s somehow match perfectly, or were the rock star’s orbs stripped in, later? What’s without contest, however, is that this is an amazing photographic image. 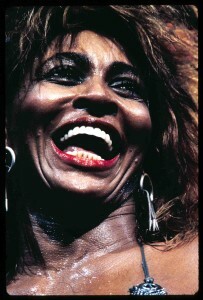 So is this 1985 photo by Henry Diltz of Tina Turner at LA’s Universal Amphitheater, right. Both do what photography does best: Isolate the moment with verity; freezing it so that we may contemplate and examine it in a way that is impossible in life. Gail Buckland is a guest today on my WBAI-NY / 99.5 FM radio show, NONFICTION, this afternoon, Friday, January 8, at 2 pm ET. We’ll also be speaking with photog Sue Kwon, whose Street Level: New York Photographs 1987-2007 documents the seething energy of the metropolis in which she lives from a personal p.o.v. 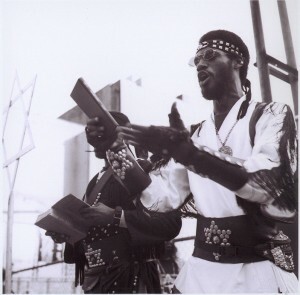 Kwon works by getting close to the people and cultures that fill the city, working at eye level, crafting typically black and white images of the sights that meter daily life of the five boroughs; for example, this image, above, of Black Israelite proselytizers. You can hear both Gail Buckland’s and Sue Kwon’s ideas by tuning in at 2 pm. If you’re outside of the New York tri-state, check out our live stream on the web. If you miss the live show, dig into our archives for up to 90 days after broadcast.